250 ml (1 cup) flour, seasoned with salt and pepper. Seasoned bread crumbs & Tasty Chicken. Coating flour. 1-liter sunflower oil, for deep-frying. Slice the chicken into strips. Heat the oil in a medium saucepan. Place the flour, eggs and crumb coating in three separate bowls. Coat the chicken strips first in the flour, then in the egg and finally in the crumb coating. When the oil is hot, fry the chicken until golden brown, crisp and cooked through. Remove from the oil and allow to drain on kitchen paper. To make the dipping sauce, combine the tomato sauce, smoked paprika, and lemon juice. 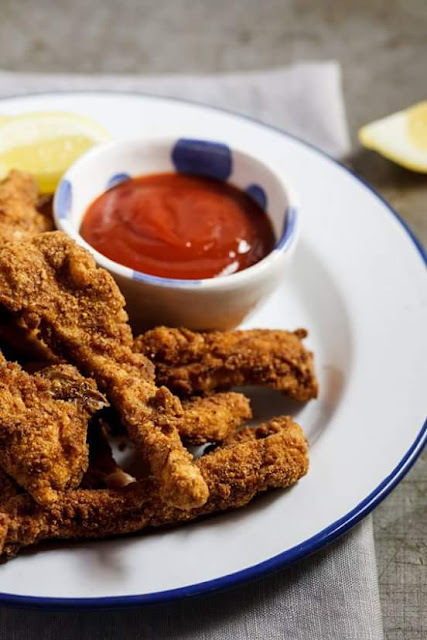 Serve the chicken strips hot with the smoky tomato dipping sauce. Note: You can season the coating flour with your own seasons.